On and off-set high-end post-production demands a new level in processing capability, storage speed, and general computing horsepower to handle the ever increasing standards for digital workflow. Utilizing PCI Express® (PCIe) performance and 20Gbps of throughput, Thunderbolt 2 technology offers the fastest way to transfer data between Thunderbolt equipped peripherals such as high-speed storage devices, video capture cards, and desktop or notebook computers. The computer of choice for many within post-production has been the Apple® Mac Pro® until now this has not lent itself easily to portable workflow. Its bulky desktop design made rack-mount carts necessary and was less than convenient in constantly moving on-set post-production situations with space-constraints. Shipping since last December, the latest Mac Pro is dramatically more transportable, in that it is much smaller, lighter, and flaunts an unprecedented six 20Gb/sec Thunderbolt¢ 2 ports, providing for expansion equipment that can be connected as needed. However, many professionals, still using the large-style installed base of previous generation Mac Pros, have loaded these systems with additional storage, graphics, and I/O PCIe cards and are now wondering how to deal with the lack of internal expansion in the new Mac Pro. On the other end of the portable workflow spectrum are Apples light, yet staggeringly powerful MacBook® Pro family, which offer substantial processing power, the tiny-footprint Mac mini which also offers amazingly good performance and at a fraction of the cost of larger workstations. Although processing power alone is only part of what is needed for an on- or off-set post professional to run an efficient workflow. The requirement for PCIe expansion slots is still a must for installing specialty cards to connect various audio/video I/O, graphics accelerators, high-speed storage, and connectivity for high-end network capability. Sonnet Technologies Echo¢ Express range of Thunderbolt 2-to-PCIe expansion systems is designed to leverage the paradigm shift in connectivity initiated by the new standards in high-end digital workflow and enabled by Thunderbolt technology. These products solve the expandability problem by providing an external chassis for connecting PCIe expansion slots to any Mac computer with a Thunderbolt port, including not only the Mac Pro but the iMac®, Mac mini, MacBook® Air, and MacBook Pro®. With an Echo Express chassis, these computers are able to use any Thunderbolt-compatible PCIe card, including professional video I/O, audio interface, SAS and SATA HBA, 16 Gb and 8 Gb Fibre Channel, 10 Gb Ethernet, and RAID controller cards and many more. 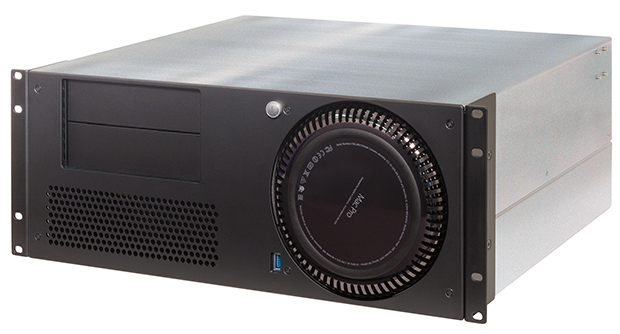 As one of the newest members of Sonnets Echo Express line, the Echo Express III-R rack-mount chassis is the first device of its kind to ship with Thunderbolt 2 interfaces. The dual Thunderbolt ports support daisy-chaining of additional Thunderbolt devices, and at only 2U tall the Echo Express III-R mounts in any rack space and accommodates up to three full-length, full-height, single-width PCIe 2.0 cards with one x16 and two x8 PCIe slots. The Avid certified Echo Express III-R supports Avid Pro Tools|HDX PCIe cards, meaning that Mac users are no longer limited to a Mac Pro-based workflow in order to exploit the tremendous capabilities of Pro Tools|HDX. For audio or video professionals that have moved up to the new Mac Pro, Sonnet Technologies has introduced the xMac¢ Pro Server. This device is a 4U rack-mount enclosure for the new Mac Pro that delivers the same PCIe-to-Thunderbolt 2 expansion capabilities and rack-mount convenience as the Echo Express III-R. Like the III-R, the xMac Pro Server was designed to be remarkably quiet so that it can be comfortably used in noise-sensitive environments. Both the Echo Express III-R and xMac Pro Server offer optional Mobile Rack Device Mounting Kits that enable users to install two 5.25-inch form-factor mobile rack devices in the chassis enclosure. Ideal for productions with limited rack space, the kits supports a wide array of devices ranging from an internal LTO tape drive plus four swappable 2.5-inch SSDs, to an optical drive plus a Sonnet Qio¢ MR pro universal media reader. Within the chassis, the Mobile Rack Device Mounting Kit houses one full-height (3.2 inches) or two half-height (1.6 inches) mobile rack devices up to 8 inches deep. These expansion systems bring the ultra-fast connectivity of Thunderbolt 2 to location and postproduction professionals who now have the necessary tools they need for maximum efficiency on even the most demanding of productions. Transforming audio and video workflows, these technologies are enabling digital workflow pros to travel light and work in places and ways that they never before thought possible.